We all know how expensive the drill machines can be so we need to make the most out of them in all cases. 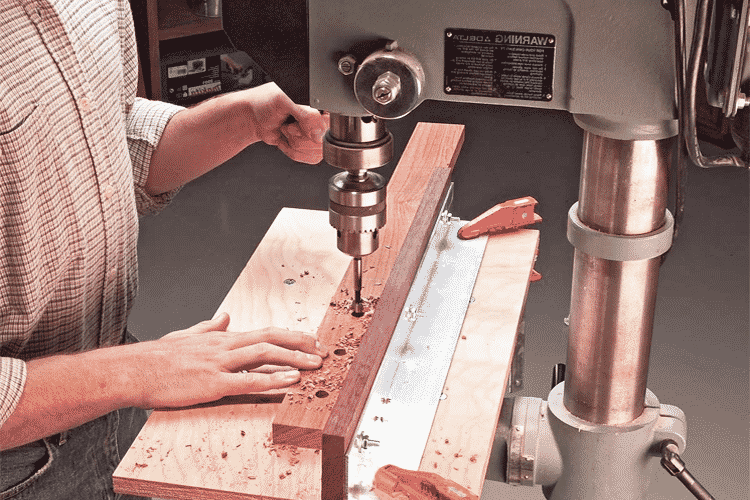 So, if you are just using your drill press for one specific reason then I have to tell you that you are not utilizing that wonderful machine. There are so many other things that a drill press can do and you must know about these in order to use that machine to its fullest and today I am going to lead you through all of those techniques. You might have to use one or two accessories with your machine to achieve these tasks but I promise you that it’s all worthy of being used. You will get to do so much more with your drill press if you simply add the attachments and follow the techniques. Some of these have been used by professionals for a very long time which even comes with manual and others are just improvised techniques. I have been working with woods and metal ever since I graduated from the college. I had this dream to build my home with my own hands and thus I came to know what a good drill press can do. It makes your works so much easier if you just know how to use it. I have done my extensive research on this machine and today I am going to tell you all of my secrets on ten different types of tasks that a drill press can do. So, without further delay; let’s get to the review. If you are looking to remove the burrs and the burr areas from the object then there is no alternative to countersinks. It is one of the most basic types of function that a drill press can do. It starts off with a cone-shaped engraving using a conical drilling instrument and gradually increases its orbit and drills the object as directed. Sometimes it can also swivel the round if the machine allows it to. Some brands are very cautious about the countersinks so the provide smoother edges for the drillers. The countersinks are great to flush fit things quickly if they are relatively flat-edged. You just have to be careful about the alignment and the drill machine will do its magic. Sometimes you will need to drill a hole that is too hard for a normal drill to handle. You need a lot of holes and at the same time, you wish to see equal smoothness. You need the plain old boring in these cases. Use a dialer to set the size that you want to drill then insert the object into the machine. You must also determine the machine speed and the needle size then you can start boring. If you are not good with positioning then use a smaller needle to do some pilot strokes. When you have your basic pilot drill done then you can move onto the counterbores. These are usually used to enlarge an already existing hole into a perfectly desired measurement. It can enlarge the hole both horizontally and vertically depending on the type of needle that you are using. Counterbores are a very famous technique among the perfectionist driller as it gives you more room to improve your drilling at all time. These are used to later fill them with bolts, screws, sockets and so on. A drill press can do perfect tapping if you have the right tools. Taps are usually used to cut internal threads with great excellence and control. If you have already dug a hole with the drill press that needs a cross section then you can use the tapping option. There are mainly two types of tap that can be performed. One is the starting tap which lets you start the thread in a particular place and the latter is the plug tap which is used to end the process but cutting the thread. There are some attachments available on Amazon.com that allows you to use the drilling machine as a slashing device. You can literally cut through thick objects in a blink of an eye with the help of the slasher attachments. You have to align the object and the slasher blades properly in order to do the pilot strokes. After that, you must lock the object and just the slashing. It can come handy if you do not have a separate slasher. If you are working with wood then you would be happy to see what a well-branded drill press can do. It can work as a duster for your woods. You need to attach a small dusting attachment with the tip of the drilling needle and it will instantly turn into a duster. This is a very clever trick that helps you to get the advantage of two machines into one. You can also use different types of fishing duster to give your wood more perfection. This is a hybrid between the countersink and the counterbore. Well, basically this technique tells you to skip the pilot stroke and start drilling until the bottom end. This is a very useful stroke when you do not have much time to focus on the perfection of the machine and just want to get it done. This is faster and saves a lot of time. Plus, you do not need to change the needles in between if you are using this stroke. If you are looking for more accuracy at a faster speed then reaming is the thing for you. With this technique, you can accurately drill a ton of objects in a quick amount of time. You just need to set the drilling pace, length and the right needle for the task. It will make you think that a drill press can do anything. You have to start with a pilot drill in the whole body and then you can start reaming. But, be sure to polish your angle when you are moving from one hole to another. You can use a drill press to screw the bolts and as well as unscrew them. It is not a secret technique but it is very effective. You need to set your machine speed to the lowest and use an adapter if necessary. Then use a needle that complies with your bolt and then you can use the thing as a screwing machine. This not only allows you to do the screwing but also allows you to get the work done in a very short amount of time. You need to have some sandpaper attachment in order to do this with your drill press. If you do not have such attachment then you can make one your own by reading some blogs. After attaching that with the drill press you will be able to use the drill press as a well-functioning sander. You will be surprised to see how a drill press can do such effective sanding. You can try out the different layer of sanding paper in the process as well. I hope you will be able to make the most out of your machine by following these techniques and these different strokes. But, you really need to have a good drill press to perform all of these strokes and technique. You can go through some well-written reviews in order to make up your mind in this matter. I hope this article was very helpful for you guys. Be safe while working with an electric device. With that note, I am signing off. See you next time. Goodbye! 5 Planer vs Jointer – Which One Should You Buy?